With my first Wedding Anniversary right around the the corner, I have got all the reasons to bake this week and woo my husband. 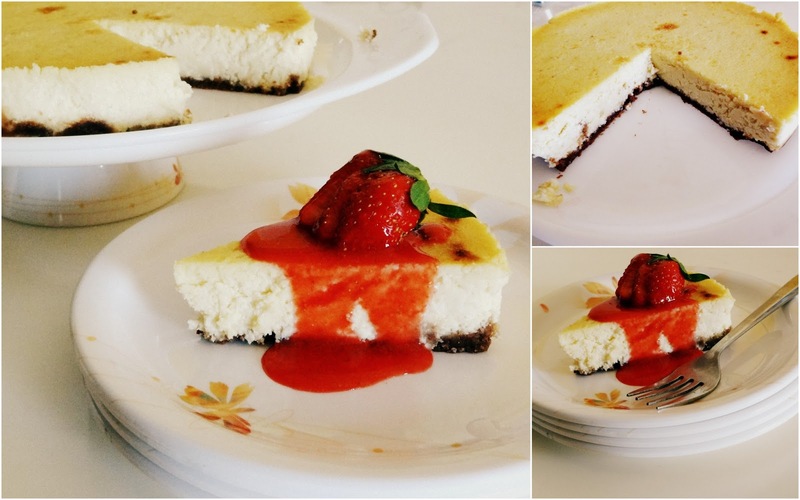 What's better than making a Cheesecake at home to celebrate a beautiful Sunday morning when all the family members are at home. 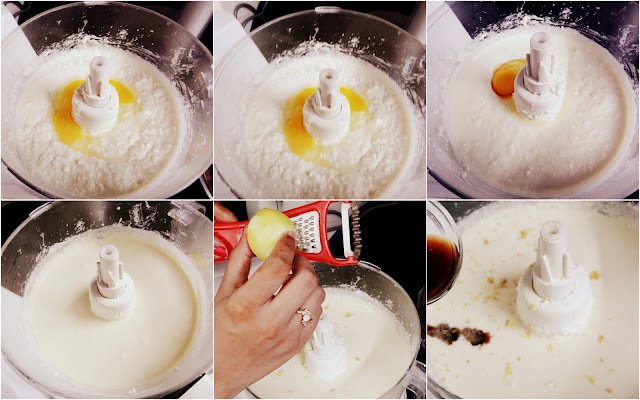 Without talking any further, lets get straight to making Ricotta Cheesecake. Serves - 8 to 10 people. Preheat your oven to 180° C/ 350° F. Grease the sides and bottom of your 9 inch spring form pan with butter or non stick cooking spray. Wrap the outside of your spring form pan with two layers of aluminium foil from the sides and bottom and keep it aside. Crush the graham cracker/ digestive biscuits in a plastic bag stammering with a rolling pin. Place the crushed biscuits in a bowl and add sugar and melted butter and mix it all to come together. 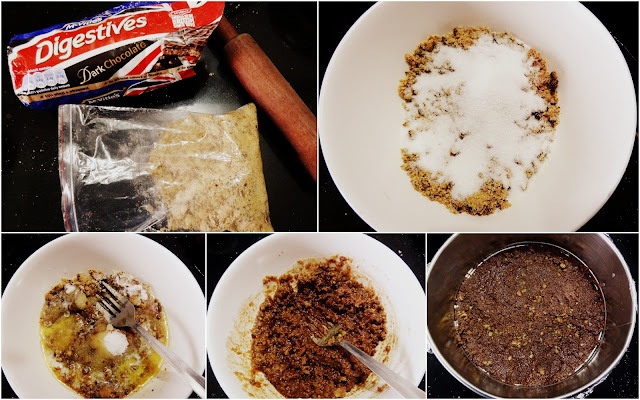 Press the biscuits mixture over the bottom of the cake pan and keep the pan in the refrigerator till you prepare the filling. 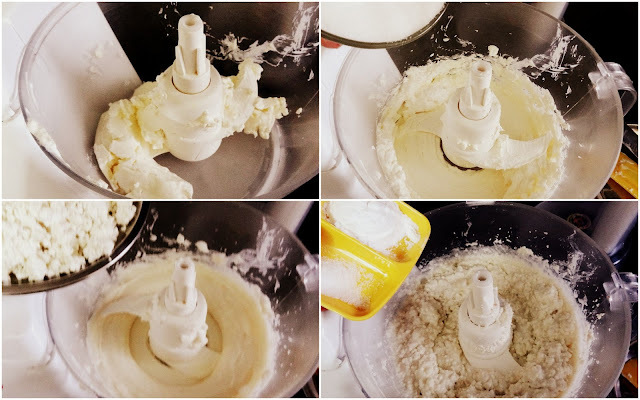 In the bowl of your food processor or electric stand (or hand) mixer, place the cream cheese and process it for a few seconds until smooth with no lumps. Add sugar, ricotta cheese and process it until well combined. Add in the corn starch and salt and again process it for a few seconds until smooth and combined. Add in the eggs, one at a time and process until incorporated. And finally, add in the lemon zest and vanilla and process it until all the ingredients and well incorporated. Thats it, we are done! Its as easy as that. Remove the pan with the crust from the refrigerator and pour in the cheesecake filling. In a large pan, pour the boiling hot water so that the water in the large pan come halfway up to the sides of the spring form cake pan. Line the bottom of the pan with a kitchen towel. This process is known as water bath. 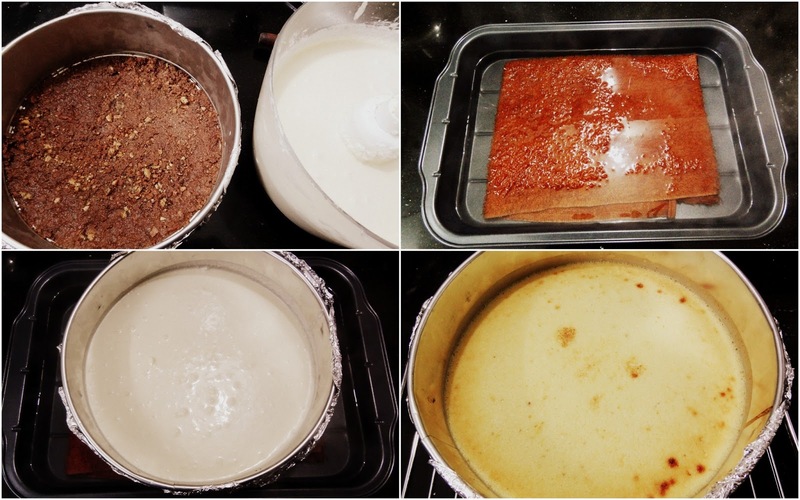 This method is used to bake the cheesecake as the texture of cheesecake is similar to custard and its best to bake in a water bath. 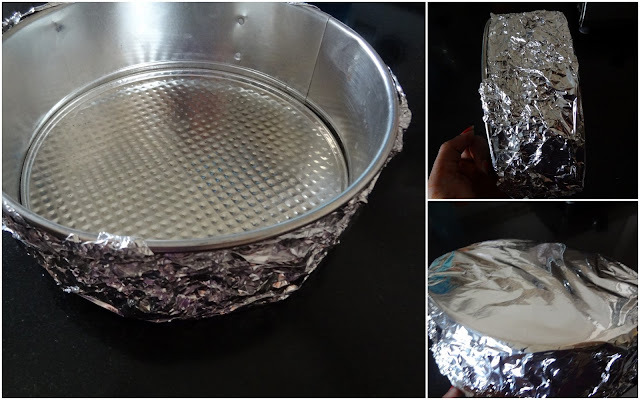 Place the spring form cake pan in the pan and very carefully place the large pan in the oven. Mind the words "very carefully", you are dealing with the boiling hot water here and don't want to burn yourself. Bake it for about 50 to 60 minutes, or until the cheesecake is set, or yet moves slightly when the pan is shaken. Remove the cake from the water bath (or it will continue to cook under hot water) and cool it completely on a wire rack. Then cover the pan and let it chill in the refrigerator for atleast 4 hours to preferably over night. This cake stays best for 3-4 days in the refrigerator, or it can be frozen. Enjoy this wonderful cheesecake with some fresh strawberries and strawberry sauce or any of the berries from the berry family for that matter. Hope you will also enjoy baking this wonderful cake as much as I did! Don't forget to share your experience with me. I would love to see your comments!